Today, a group of children from Year 5 went to Shaftesbury School to join over 50 other students from Primary and Secondary schools across Dorset and Somerset to learn about Bullying and how to deal with it in school. The children all had a great time and are looking forward to looking at how they can use these ideas at SPS! We had an amazing time at Monkey World yesterday and we also learned loads about the important work they do. An inspirational day. Year 5 have had a brilliant day dressed up as their favourite book characters! 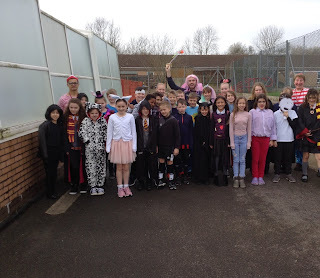 There are some lovely costumes and the children all enjoyed spending time reading with some younger members of the school! Year 5 had a fantastic visit to Monkey World yesterday where they found out about the conservation of different species of Monkey at the park and how some of the animals ended up there. Thank to our parent helpers who came along for the day! Year 5 have had a fantastic day learning about friction, gravity and air resistance as part of wheels day! The children enjoyed experimenting with their own sets of wheels and were all very well behaved!